The famine affected every country in the world and people came to Egypt to buy grain. When Jacob saw that there was grain in Egypt, he told his son to go to Egypt to buy grain. Joseph’s ten brothers went to Egypt to buy grain. The youngest son of Jacob, Benjamin did not go with them because Jacob was afraid that something bad will happen to Benjamin. Joseph was the governor of Egypt and he was in charge of selling grains to all the people. When Joseph’s brothers saw Joseph, they didn’t recognize him. Joseph saw them and immediately knows they were his brothers. Joseph pretended not to know his brothers. Joseph denied their excuses. Joseph demanded that they bring their youngest brother, Benjamin to him but until then, he will take one of them as prisoner. 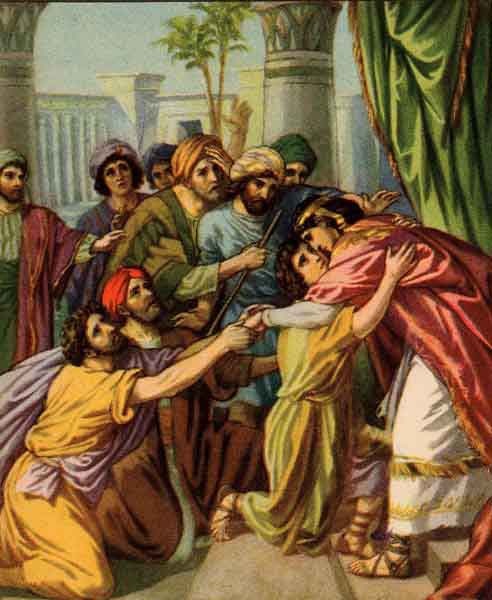 Joseph heard what Reuben said, and he turned away to cry. Then he took Simeon, and bound him before his brothers. Joseph told his servants to fill their sack with grains along with each one’s money for the grains. During the journey, Joseph’s brothers stopped to rest. As each man opened their sack to give grain for their donkeys to eat, each man found their money in the sack. Then Joseph’s brothers return to Canaan and told their father all about it. They told Jacob that if they were to return to Egypt to buy grains, they will have to take Benjamin along. Jacob denied their request and will not let Benjamin go with them. But Jacob still would not let Benjamin go to Egypt because he don’t want lose Benjamin like he lose Joseph. Once again, there is no more food left and Jacob told his sons to go to Egypt to buy grains. After numerous times of persuading their father to let Benjamin go with them, Jacob agreed to let Benjamin go. Jacob told his sons to bring balm, honey, spices and myrrh, pistachio nuts and almonds as gifts to Joseph. Jacob also told his sons to take double portion of money with them because of the incident last time. When Joseph’s brothers arrived at Egypt, Joseph asked his servants to bring them to his house to have dinner. Then Joseph free Simeon and gave back him to them. Joseph’s brother brought out the gifts for Joseph and passed it to his steward so that he may pass it to Joseph. Joseph asked his brothers about their father well being. When Joseph saw Benjamin, he went to his room and cried for a while. Then he washed his face and came out to eat a meal with his brothers. Joseph then served food for all his brothers but he gave Benjamin 5 times more food than the other brothers. So they ate and drank and were very happy. Then Joseph commanded his steward to fill each man’s sack with grain. Joseph also commanded his steward to put his silver cup in Benjamin’s sack. When daybreak, Joseph’s brothers went on their journey back home. So the steward overtook Joseph’s brothers. He found Joseph’s silver cup in Benjamin’s sack and they all went back as hostages to Egypt. When Joseph’s brothers saw Joseph, they were very afraid and bow down before Joseph. Then Joseph revealed to his brothers that he is Joseph, their brother whom they sold as slave to the Ishmaelites. Joseph’s brothers finally recognize Joseph. Joseph fell on his brothers and wept. Joseph hugged and kissed his brothers. It happened that rumor about Joseph’s brothers was spread to Pharaoh. Pharaoh then commanded Joseph to tell his brothers and father to come down to Egypt and live in Goshen. Then Joseph gave them carts to carry Jacob who was very old now and the children to Egypt. Joseph also give his brothers 10 donkeys with Egypt’s fine products, and 10 female donkeys that are loaded with grain, bread, as well as food for his father for the journey.